File system monitor filter can monitor the file system activities on the fly. With file system monitor filter you can monitor the file activities on file system level, capture file open/create/replace, read/write, query/set file attribute/size/time security information, rename/delete, directory browsing and file close request. You can develop the software for . You can develop the software for continuous data protection (CDP),auditing, access log, journaling. 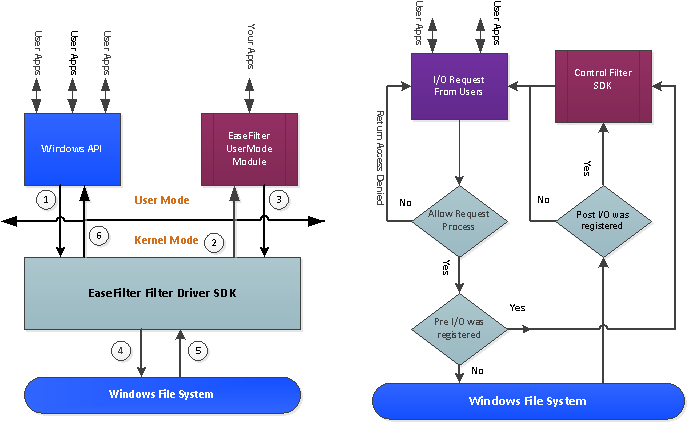 File system control filter can control the file activities, which you can intercept the file system call, modify its content before or after the request goes down to the file system, allow/deny/cancel its execution based on the filter rule. You can fully control file open/create/replace, read/write, query/set file attribute/size/time security information, rename/delete, directory browsing these Io requests. File system encryption filter provides a comprehensive solution for transparent file level encryption. It allows developers to create transparent encryption products which it can encrypt or decrypt file on-the-fly. The encryption engine uses a strong cryptographic algorithm called Rijndael (256-bit key), it is a high security algorithm created by Joan Daemen and Vincent Rijmen (Belgium). Rijndael is the new Advanced Encryption Standard (AES) chosen by the National Institute of Standards and Technology (NIST). Recent Changes: Added support multiple exclude file filter masks to the same include filter mask. Added new access flag which it can block the file access from network server. SMTP/POP3/IMAP Email Library. Send and receive email from a dBase application. SMTP/POP3/IMAP Email Library. Send and receive email from a FoxPro application. SMTP/POP3/IMAP Email Library. Send and receive email from a Visual Basic app.